I need help. I need to hear from God about this, and I’m not getting anything at all. It doesn’t take long for me to discover that God has been speaking to them, and that they are hearing him, it’s just that they don’t have the confidence to believe that what they’re getting is from God. 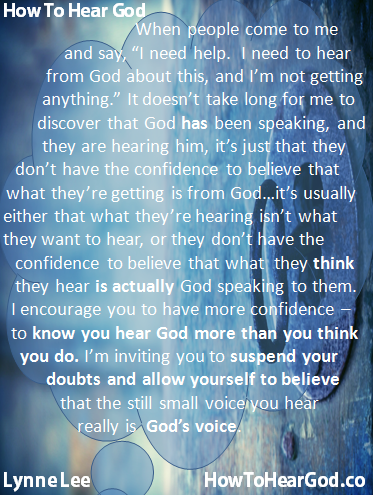 It’s usually either that what they’re hearing isn’t what they want to hear, or they don’t have the confidence to believe that what they think they hear is actually God speaking to them. I encourage you to have more confidence, to know you hear God more than you think you do. I’m inviting you to suspend your doubts, and allow yourself to believe that the still small voice you’re already hearing really is the voice of God. If you would like help to learn how to recognize when it’s God speaking rather than just your own thoughts, I recommend you check out this coaching guide. It’s full of wisdom and simple steps.